This monobloc machine is quite easy to be operated and maintained with the adopting of PLC control of frequency conversion Timing. All the parts contact with liquid are made up of high quality stainless steel, both exterior and interior of the machine are polished for easily cleaning and good hygiene codition. The sealing parts are all imported from foreign countries, which meets the requirement of the hygiene of the foodsafety. 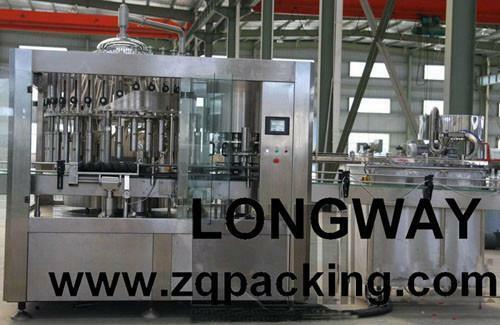 Rotatory bottle-rinsing machine has the functions of not opening the valve and rinsing without bottle, which is working from bottle entrance,bottle transportation,bottle clipping,bottle turning around with synchronously rinsing inside of the bottle to water-dropping and exit have the functions of not opening the valve and rinsing without bottles. Adopting the way of filling by holding the necks of the bottle, plus the function of pre-cover of the centralizing cover with high precise centralization,which ensure the right seating of mouth of the bottle and filling valve,with low liquid loss. Adopting crowning the caps with magnetic force,which passes the torque with powerful and constant magnet,and the torque can be adjusted to meet the need of many kind of plastic caps. Its easy to be maintained and used with the adopting of concentrating or automatic lubrication system and the structure of full-open protection. The advanced CIP series can clean and sterilize all the containers and insides of all pipes before and after the operation.